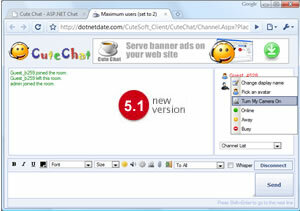 This Ajax based chat system has been the choice of the leading web sites, from around the world, from small to largest Portals for community building, distance learning, live events, romance and dating, online business meetings, support groups, online sales, help desks, chat room hosting, and more. Copyright 2003-2010 CuteSoft.Net. All rights reserved.